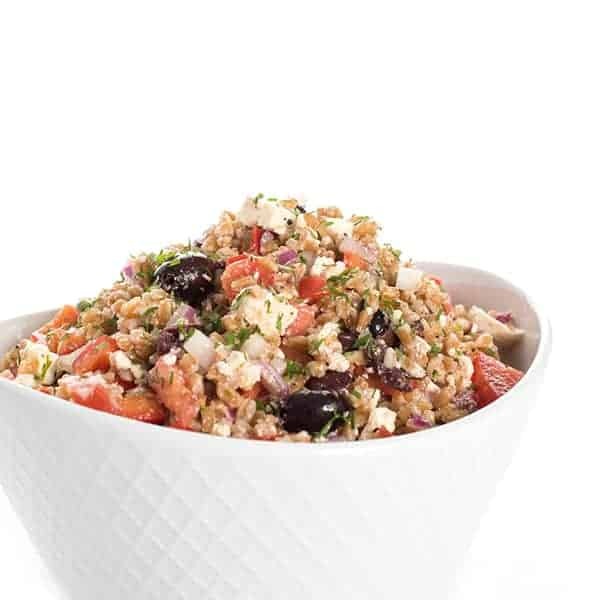 Chewy farro is tossed together with classic Greek flavors like fresh dill, kalamata olives and feta cheese to create this healthy and delicious whole grain salad. If you’ve read my About Page or follow me on Instagram during the summer months, you probably know that Lake Michigan is my favorite place on Earth. While it is technically a lake, you may be surprised to know that it looks like an ocean with white sandy beaches, minus the seaweed, sharks and salt water. In addition to the breathtaking scenery, one thing I love most about spending time on the lake is the fact that we rarely go out to eat. We cook every meal from scratch and since we are usually there in the summer, these meals are often comprised of farm fresh produce, grilled meats and other healthy goodies. Greek Style Farro Salad was the first dish I created for the 2014 cottage season. It’s ideal for a day at the lake because it can easily be doubled or tripled to feed a crowd. I love using Bob’s Red Mill farro because the chewy, hearty texture holds up well to heat and time. It tastes delicious cold but is equally wonderful at room temperature. You could add chicken, chick peas or another form of protein but farro itself is also an excellent source of protein, fiber and countless nutrients. This dish can be made in advance which makes it perfect for parties, picnics, BBQ’s and more. If you don’t think your family will enjoy farro, I urge you to try this recipe. My cousins aren’t exactly the most adventurous eaters around and they were licking their plates and asking for seconds. 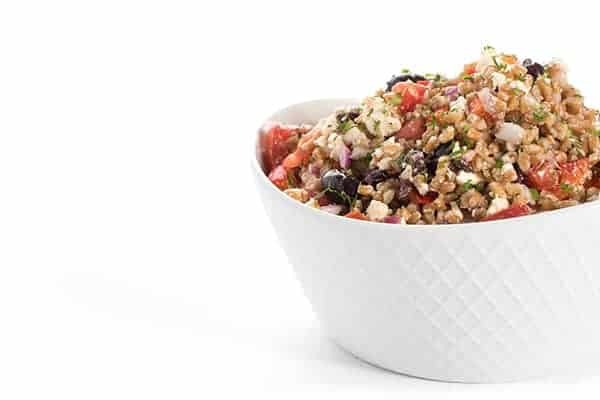 Toss together cooked farro with tomato, red peppers, onions, olives, get and fresh dill in a large bowl. Add olive oil, lemon zest, lemon juice, salt and pepper to the bowl. Stir well. Check for seasoning and adjust accordingly. This salad holds well can be stored in an air-tight container in the refrigerator for up to 5 days. Over time, the farro will absorb the vinaigrette. 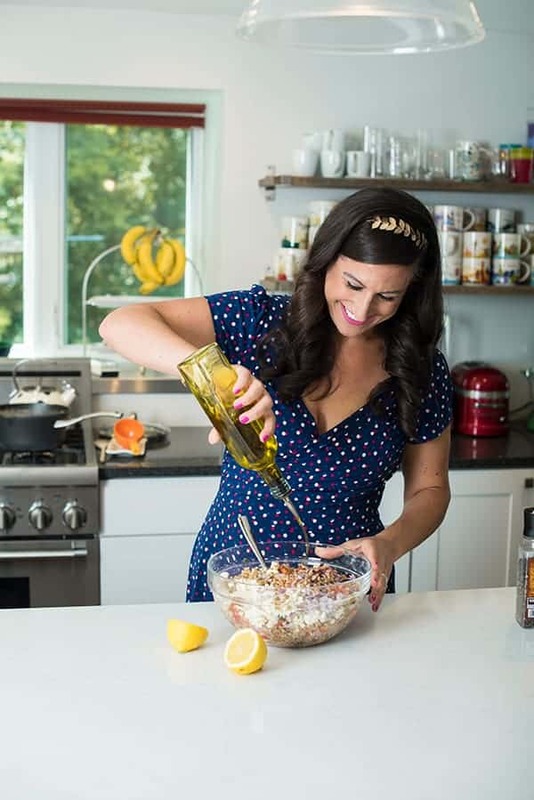 Simply add more olive oil or lemon juice if you are serving a few days after preparation or wait to add until right before serving. Disclaimer: Bob’s Red Mill has compensated me for my time to create this recipe. Thank you for supporting the brands that make The Lemon Bowl possible. As always, all thoughts are 100% my own. 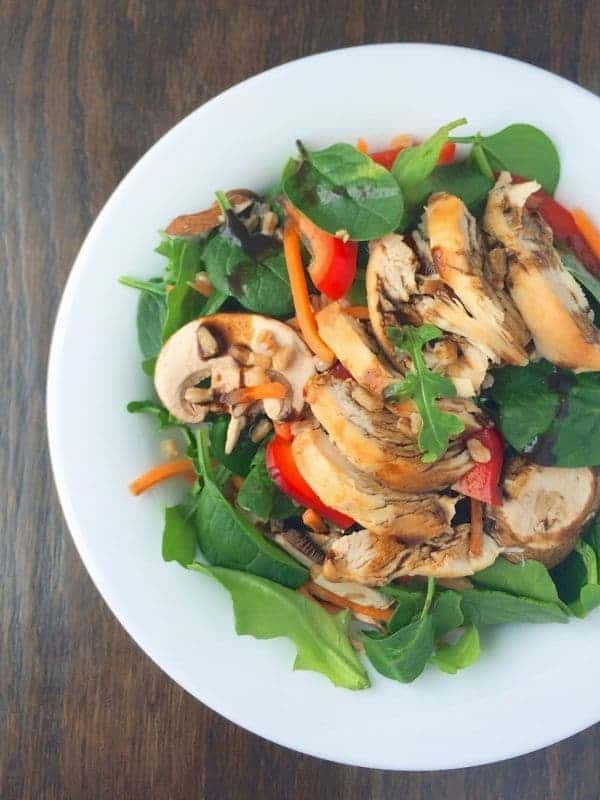 Want more satisfying salad recipes? Head over to my Pinterest board! Yummy, I love this salad already! Thanks for this recipe! This salad is calling my name!! Such a wonderful combo, looks healthy and yum! Love that this salad is picnic and potluck ready! Farro is such a favorite in my house! YES!!! I hope you love it! This sounds and looks so good!! On my list. I seriously love the texture of farro, it’s the best! I also really love the addition of olives in this salad. Both times I was pregnant I craved olives all the way through and those cravings never went away! Isn’t it so good?? I’m so glad!!! Yay! I’m a “Jersey” girl thru & thru. I love the jersey shore, but Lake Michigan looks beautiful!! I made this salad to bring to a friends BBQ. It was the hit if the party!! Some didn’t know what farro was… I love it!!! My hubby hates olives (silly man!!) & pulled them out, said he still loved it!! I had to give the link to your recipe to 4 ladies!! Great recipe, thanks!!! I’m so thrilled to hear it Bonnie!!! Thank you!!! Big grain salads like this are the best! Gotta love those Greek flavors. I’ve got a huge batch of spelt cooked up to use this week! This was so delicious! The perfect summer salad!! You had me at Greek! LOL! But I also love that you used farro! That is one grain I have yet to try! LOL!!! I can’t quit the Greek food! Wish I had this for lunch today! 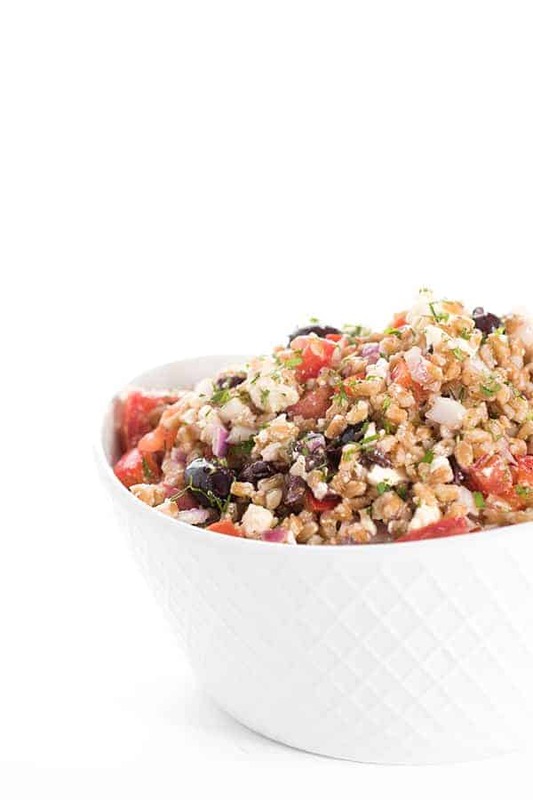 LOVE farro, and anything greek inspired, so this recipe sounds like the perfect combination of two things I loooove, so I definitely need to make this, like, yesterday lol! 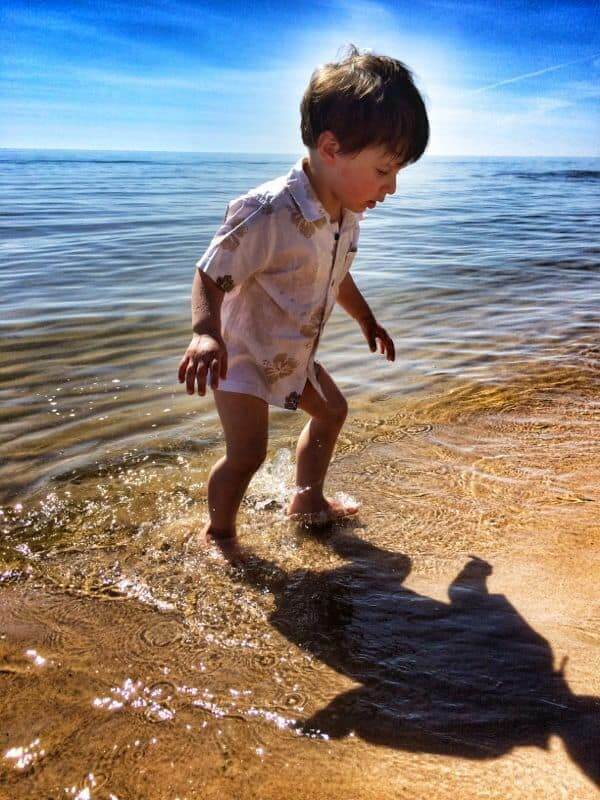 Your Lake Michigan days look absolutely idyllic! 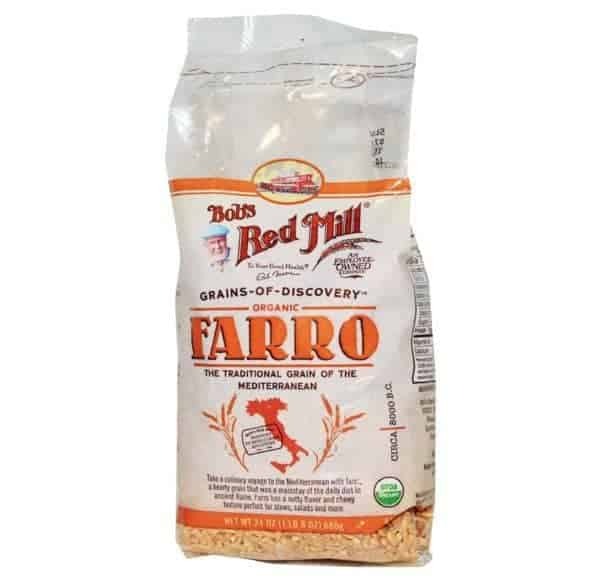 I didn’t know that Bob’s Red Mill made farro…I’ll have to look for it at my grocery store. This salad just screams “summer” to me, Liz! Let me know what you think of it – it’s one of my favorite grains and I think you’d like it too!! 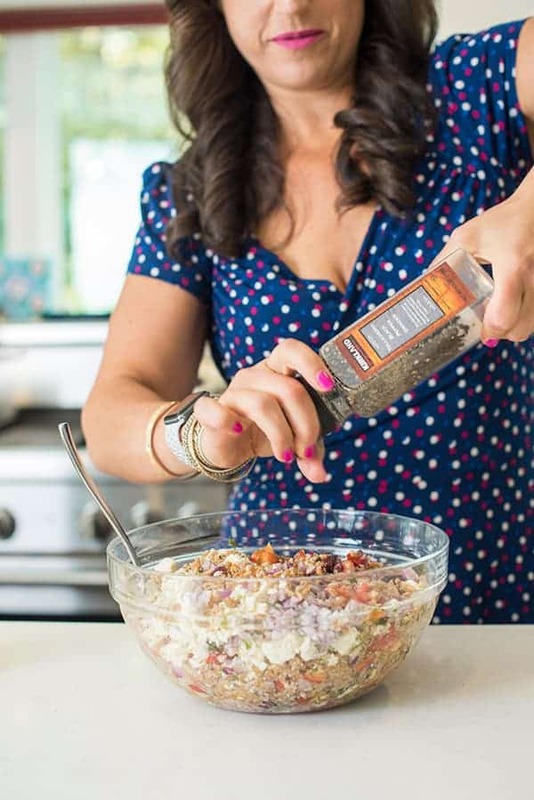 This salad, maybe with Forbidden Rice or cooked sorghum for a gluten-free version, is calling my name! Although I love my summers by the beach, one of the best summers my family and I ever had was when we rented a house on a lake in Wisconsin-the perfect blend of days of the lake, lazy afternoon naps, followed by a cocktail and home cooked meal. Divine :-) Hope you and your family are having a wonderful summer Liz! I love the idea of a forbidden rice version!! I actually also have a brown rice Greek salad you would love. I want to spend a week with you at the lake and eat a bowl of this farro! PLEASE!!! We will have tots and drink ginger drinks and you’ll make all of our breakfasts. Love the flavours in this salad; a perfect summer dinner! Goodness, Lake Michigan looks breathtaking. LOVE this salad too! Great flavors! I love Greek inspired salads. I also have some farro hanging out in the back of my pantry… I need to give this a try VERY soon. Also, your pictures are gorgeous! You need to bring the farro out!! I really have been meaning to eat more grains other than oatmeal and quinoa, and I do love me some farro! Especially when it’s Greek salad-i-fied (my fav salad!) Love this recipe Liz! Pinned! Farro is the bees knees!! And nice to change up from the usual.